The BITS Pilani Sports Fest (BSF) is an annual extravaganza where the cream of the sporting talent from several universities, congregate to exhibit their prowess in numerous sports. From its humble beginnings in 2000 as an inter-college event, the 7th edition of the BSF began on 18th April 2010. The event commenced with a torch rally which was inaugurated by officials from BITS Pilani and the Student Hub, Dubai International Academic City; followed by a march past from the participating universities at BITS Pilani, Dubai. The first day saw a volleyball match with Manipal boys playing Herriot Watt and beating them 2-1. The three set match got off to a shaky start when Herriot Watt took the first set 25-17. However, our boys fought back to win two consecutive sets at 25-19 and 15-8. Manipal Boys took on Ras Al Khaimah Medical University in Basketball. The Medical University, which is participating at the BSF for the first time, performed well but were outdone by the Manipal team by a slight margin. After a nerve-wracking 40 minutes, and a close match, Manipal outdid RAK Medical University 35-33. Manipal girls had a long day ahead of them with four games to compete. The first game was Badminton. Due to a no-show by the opponent team, Manipal got a walk over and will now face the hosts, BITS in the finals. 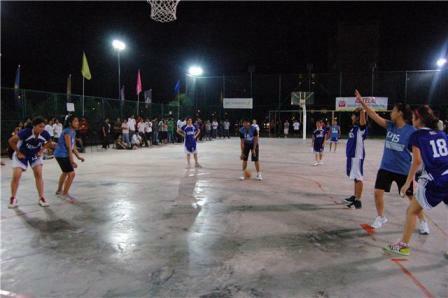 The next game of basketball was held on the BITS cement court against Preston University Ajman. From the start of the game, we took the lead and maintained it all the way to victory. The scoreboard read as 31-13. The girls supported each other well. Roshny Ravindran (3rd year; Media and Communications) and Klarissa (2nd year BBA) were the forerunners in putting up a good score and were successful in concerting almost all their free throws. After basketball, it was time to go back indoors for table-tennis. The game against RAK Medical University was an easy one. The first singles, played by Roshny Ravindran, was won in three straight sets. The game was won 12-10, 11-2, 11-5. The second singles was won by Joanna Marie Dias (3rd Year, BBA) 11-6, 11-6, 11-6. Ayesha (3rd year, BBA) and Nikita Phadke (1st year; Engineering) breezed through the doubles, securing Manipal Univerisity to the finals with Wollongong. The doubles scored were as follows: 11-4, 11-5, and 11-1. The final game for the evening was throw-ball against Preston. Manipal girls enjoyed their game so much that it reflected on their performance. We won the game in two straight sets 25-10, 25-10 and qualified into the finals against BITS. 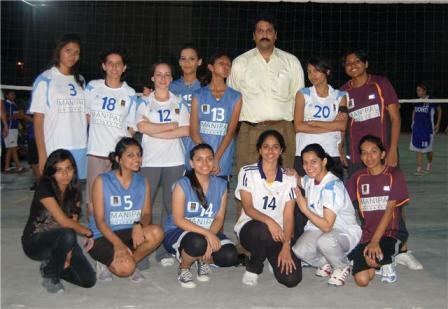 The girls were all geared up to face hosts BITS in the throwball finals. With much excitement on court, the game started off amidst much cheering from supporters of both universities. BITS got off to a good start and were leading the first set 16-9. But our girls fought back to win the set 25-20. The next set was a very close one. Manipal took the lead in the second set making sure that they did not give away too many points. However, BITS slowly caught up and soon became the dominating side winning the second set by a mere two points (25-23). With the decider set in play, there was great tension in the air for both sides. This set would decide who would ultimately carry the victory cup. The 15 point set had both the teams giving their all to prevent the other from scoring. In the end, it was BITS who emerged the better team despite a tough fight given by our girls. The set was won 15-11 by BITS. The Manipal girls Volleyball team won three straight sets against Preston University at the semi final round with nail biting scores; 28-27; 25-19 and 15-8 respectively. Qualifying themselves to the finals against University of Wollongong, Dubai. A close match with a score of 20-25 left Wollongong the overall winners. In the Table Tennis Finals, the Manipal girls team qualified to play against University of Wollongong. Roshny Ravindran opened the first singles of a five-set match. Roshny easily won the first two sets with scores 11-5 and 11-8, but the game took a turn around as Wollongong picked the pace with scores 6-11, 8-11 and 5-11 leaving Wollongong to surpass us at the finals. While, the second singles was won by Joanna (3rd Year, BBA) 11-3, 7-11, 11-3 and 11-7. The doubles team consisted of Ayesha (3rd year, BBA) and Nikita Phadke (1st year; Engineering) won all three sets with scores 11-9, 11-5, and 11-6. For the Basketball finals, With sheer skill, teamwork and utmost passion for the game, our Manipal Girls emerged as winners against the University of Wollongong with a 6 point lead. The overall score being 35-29.